We provide aerospace-qualified small rotary and linear actuators for complex applications as well as rotating components for integration into specialty packages. Our simplest package is the in-line arrangement of motors, tachometers, gearheads, clutches and brakes, feedback sensors and the like. We can also supply complete electromechanical actuation systems, with or without controllers, to match your specific requirements for incorporation into flight control, precision electro-optical positioning, radar antenna and other high-reliability systems. Both analog and digital inputs and feedback are acceptable. Making most of the components ourselves enables us to control system integrity and component compatibility. Our AC and DC motors are designed to the exact voltage, frequency, power and performance required. 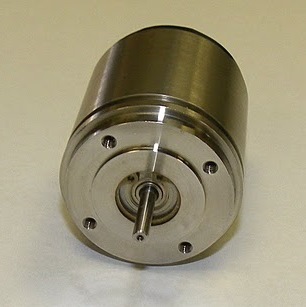 We match the speed reducer ratio to the speed, torque and acceleration required. Life, duty cycle, limit load and accuracy are considerations which further define the selection of the speed reducer. Hardened precision spur gears are supported by anti-friction bearings as a standard practice in these speed reducers. Compound gear reduction is accomplished in compact, multiple load path configurations as well as planetary forms. Integrity and compatibility are further assured by computer modeling to check frequency response, transient response under load, backlash and friction as well as other parameters in order to ensure satisfactory design and conformance with specifications. Our package envelopes, mounting means, output shafts and environmental suitability will also comply with your specifications. System modifications are made easily for optimum performance at lowest cost. Our actuators can incorporate a variety of auxiliary components such as brakes, clutches, anti-backlash gears and/or special seals. Redundant schemes involving velocity or torque summing of two or more motors can also be employed. We integrate position and velocity transducers for discrete actuator control requirements. Our engineers are pleased to quote complete actuators and actuator components.